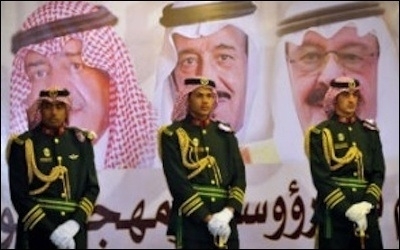 Saudi royal guards stand on duty in front of portraits of King Abdullah bin Abdulaziz (right), Crown Prince Salman bin Abdulaziz (center), and second deputy Prime Minister Muqrin bin Abdulaziz. Saudi Arabia spends money like there's no tomorrow. A new report from the International Monetary Fund suggests that there might not be a tomorrow for the House of Saud. Without massive spending cuts, the Kingdom will exhaust its monetary reserves in five years at current oil prices, the IMF reckons. Saudi Arabia is a rich country full of poor people, and the House of Saud has bought a lot of legitimacy by subsidizing its subjects. The dynasty might not survive the sort of austerity measures that the IMF insists are necessary to keep the Kingdom from running out of reserves by 2020. Egypt, now dependent on Saudi subsidies, also is at risk. Gaming the fall of the House of Saud has been a fool's pastime for years. As William Quandt wrote in Foreign Affairs twenty years ago, "There is a cottage industry forming to predict the impending fall of the House of Saud." Countless experts claimed to see handwriting on the royal palace wall, but to no avail. Thus far the wily Saudis managed to co-opt, buy off, or butcher the competition. This time is different. As IHS-Janes analyst Meda al Rowas observed last July, Saudi Arabia's clerical establishment is one of the most important stabilizing mechanisms in the kingdom. Salafist Wahhabi ideology requires obedience to the confirmed ruler, which in Saudi Arabia's case, is the king, but only so long as he enforces Islam." The Saudi monarchy's survival tools require a great deal of money. This time may be different. All of the monarchy's survival tools require a great deal of money, and the challenge to the self-styled guardians of Islamic purity from the battlefields around the kingdom gains credibility as Islam sinks deeper into chaos and crisis. As IHS-Janes analyst Meda al Rowas observed last July, Saudi Arabia's clerical establishment is one of the most important stabilizing mechanisms in the kingdom. Salafist Wahhabi ideology requires obedience to the confirmed ruler, which in Saudi Arabia's case, is the king, but only so long as he enforces Islam." The Saudi royal house allied with Egypt's military against the Muslim Brotherhood, a form of Islamism more attractive to young Saudis excluded from power and privilege by the monarchy, and ISIS is now pressing its claim to lead Islam against the sclerotic House of Saud, a risk noted by numerous Western analysts. In November 2014 ISIS chief Abu Bakr al-Baghdadi called on Muslims to rebel against the Saudi monarchy. ISIS staged suicide bombings against the country's Shia minority earlier this year to assert its authority against the government-allied clerical establishment, and a devastating attack against a Shia mosque in Kuwait last June. The royal family has responded to the Islamist threat by styling itself the Sunni champion against Iran. IHS' al Rowas warns, "King Salman's attempts to keep the clerical establishment onside, including allowing the adoption of highly charged sectarian language targeting Iran and the Shia more generally, risk backfiring in the three-to-five year outlook, particularly if Saudis believe that the Al-Saud monarchy is failing to curtail expanding Iranian influence." In the background to the sectarian war, though, Saudi Arabia's economic problems present the gravest threat to regime continuity. The 2,000 Saudi princes who control the country subsidize between a quarter and third of the Saudi population. They may no longer be able to buy social peace, according to the IMF. 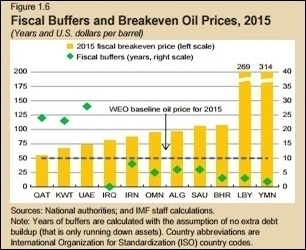 The chart at right shows the oil price at which all the major Middle Eastern producers can balance their government budgets; in the Saudi case, the break-even oil price (yellow columns) is $105. The green dots show the number of years each country has before it runs out of monetary reserves. Iraq is flat broke now. Saudi and Algeria have five years, and Iran has eight. 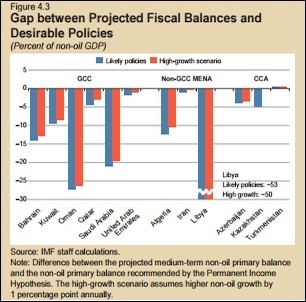 The IMF wants the Saudis to cut the spending equivalent to more than 20% of non-oil GDP, as shown in the IMF's chart below left. It's not clear whether Saudi Arabia can cut spending so deeply and maintain political stability. There is no official data on poverty in Saudi Arabia, but one Saudi newspaper used social service data to estimate that 6 million of the kingdom's 20 million inhabitants are poor, some desperately so. After the 2011 "Arab Spring" disturbances, Riyadh increased social spending by $37 billion–or $6,000 for every poor person in the kingdom–in order to preempt the spread of discontent to its own territory. Saudi Arabia now spends $48.5 billion on defense, according to IHS, and plans to increase the total to $63 billion by 2020. The monarchy has to match Iran's coming conventional military buildup after the P5+1 nuclear agreement to maintain credibility. Saudi Arabia and other Gulf States also keep Egypt afloat. They pledged $12.5 billion in new aid to Egypt earlier this year, and Egyptian media project the total aid package at more than $20 billion. Muslim Brotherhood leader Mohammed Morsi was overthrown in July 2013 as Egypt's economy collapsed, and his successor Gen. Abdel Fattah el-Sisi immediately secured help from the Gulf States. Egypt's economy is still deteriorating. 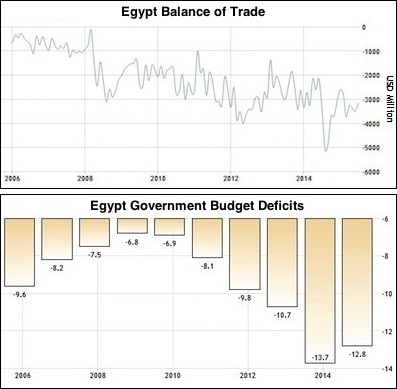 The country's trade balance has widened steadily since the 2011 overthrow of President Hosni Mubarak. The largest Arab country imports half its food, and buys nearly $40 billion more than it sells. If the Gulf State subsidy disappears, Egypt's economy will fail. Offsetting revenues from tourism have fallen sharply, down 41% from 2012 to 2013 to only $5.9 billion a year. Half of Egyptians depend on government subsidies, which have ballooned the budget deficit to 12.5% of GDP. Even under adverse strategic and economic conditions, the House of Saud would have formidable resources. Its 100,000 man National Guard is mainly a militarized internal police force staffed by tribal personnel loyal to the royal family. The Saudis and other Gulf monarchies also hire Pakistani mercenaries, who by some estimates comprise a tenth of the 500,000 military and policy employed by the Gulf states. Under some conditions the large foreign contingent in the Saudi armed forces could become a danger, e.g., in a revolt by some of the kingdom's 1.5 million Pakistani workers. In order to appease Wahhabi clerics, the monarchy has allowed its citizens to finance radical Islamist causes. In order to keep the favor of the Wahhabi clerical establishment, the monarchy has allowed wealthy Saudis to provide free-lance financing for Islamist causes that Riyadh officially rejects. A Chinese official told me recently that the one thing China fears in the Middle East is Saudi Arabia, which is funding Wahhabist madrassahs in China's Muslim-majority Western state of Xinjiang. On the surface, Saudi-Chinese relations are excellent. China is Riyadh's biggest customer for oil, although China for the first time bought more oil from Russia than from Saudi Arabia in 2015. Russia is taking payment for oil in Chinese currency, while the Saudis demand US dollars. The trouble is that the central government in Riyadh is either unable to stop individual Saudis from supporting radical groups, or it is so beholden to the Wahhabist clerical establishment that is has to double-deal. Muslim separatism is an urgent Chinese concern. Like Russia, China doesn't see Iran as a threat; Chinese Muslims are Sunni not Shia). The spread of Islamic fundamentalism from Saudi-funded madrassahs frightens China–it has no natural defenses against foreign religious ideologies on its own soil–and Saudi Arabia is looking more and more like a liability. The Saudis are learning that money can't buy strategic preeminence, just at the point where money threatens to become scarce. The monarchy has made fools of its doomsayers for decades, but it now may have passed its best-used-by-date.